The Hottest Wedding Dress of 2013 - Applique Dresses! What’s the hottest wedding dress trend for 2013?? Appliqué dresses!! Never again will a bride have to decide between lace and beading! The more bling, the better! These dresses are intricately designed to incorporate various design elements giving your wedding gown depth, texture, and personality! Celebrity brides hopped on the appliqué train right away! Pictured below is Mario Lopez’ beau, Courtney Mazza, in her stunning Ines DiSanto wedding gown this past December featuring lace off-the-shoulder sleeves and intricate silver beading. So, Westwood Brides, when you’re out shopping for your dream wedding gown, don’t be afraid to mix and match design elements! Lace is a timelessly romantic addition to any gown, and a little bit of beading or bedazzling will be sure to wow your guests and most of all, your hubby to be!! Congratulations! You’re engaged! Now the planning begins! 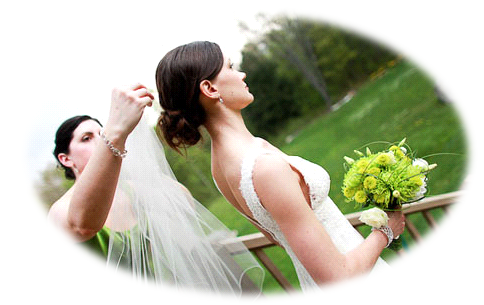 The bride and groom of course should plan pretty much most of the Wedding, but what does the maid of honor need to do? Plan the bridal shower! Leave the planning to your right hand woman, because this is a rare opportunity for the bride to relax and enjoy the company of family and friends. 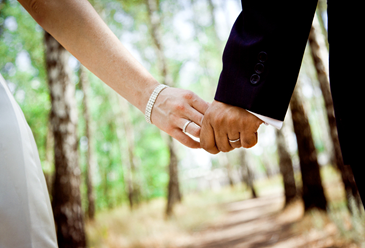 Once you know where the engaged couple is registered, it’s time to plan a date and compile a guest list. A surprise shower would be ideal, but this is difficult to do without asking the bride-to-be what her specific availability is. Try to recruit help for this if you can. Perhaps even the fiancé can assist you in this task, as he might be able to think of better reasons or excuses to want to know certain dates and times in which his or her partner would be free. As previously mentioned, showers are typically a social gathering among women, but again, this decision can be made at the couple’s discretion. It is common for the fiancé to at least make an appearance, as he will be the recipient of these shower gifts as well. It is courteous for the fiancé to be present at least towards the end of the shower to thank the guests for their gifts and to show his appreciation. 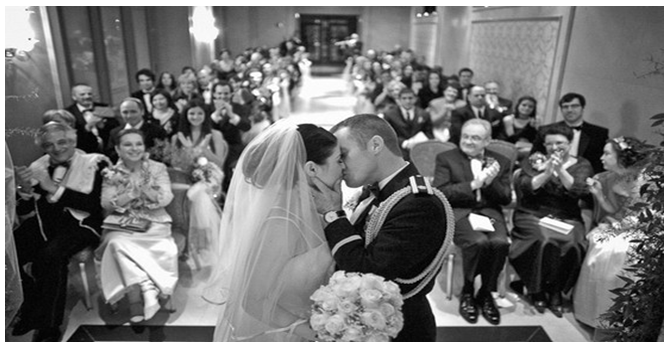 When compiling a guest list, try to narrow down the bride and groom’s guest list for the wedding to the most important or closest family members and friends (someone’s cousin twice removed does not necessarily need to be invited to the shower just because he or she has been invited to the reception). A guest list is critical to planning your budget, so try to keep the numbers relatively small. When deciding on the budget, the maid of honor should consider asking the brides maids to chip in. Sometimes the parents of the engaged couple may offer to cover certain costs as well, so don’t be afraid to ask when you begin the planning process. They also may have preferences in terms of location, venue, and dates, so it is important to take their input into consideration. Once the venue is picked and the date is set, the invitations should be sent out 4 – 6 weeks prior to the date of the shower. This will allow you enough time to receive a response from your guests and plan accordingly with your numbers. Some venues you may want to consider are restaurants that offer private dining rooms that can be rented for special occasions or larger parties. Typically the most common set-up for showers is buffet style, which allows a wider selection of food for your guests and a larger window of time for them to pick at food since it is left out for up to two hours at most venues. Many showers are scheduled in the early afternoon, so brunch seems to be the most common when selecting menus or packages. Combinations of waffles, hash browns, omelet stations, and chicken and pasta dishes are typical. Another common feature is mimosa fountains or pitchers of sangria at the guests’ tables. Some venues include a sheet cake with their shower packages (be sure to ask!!) 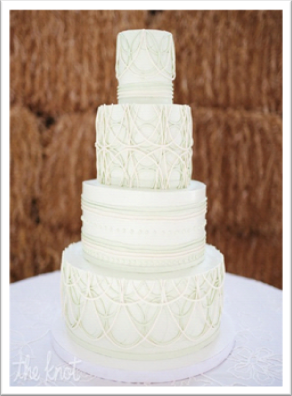 but many parties prefer custom cakes for bridal and even baby showers to personalize the event just a little bit more! Showers can range anywhere from 2 to 4 hours long. 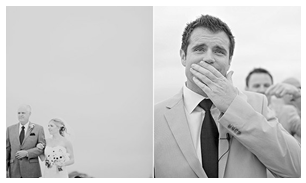 Remember, if the shower is a surprise, you need adequate time for your guests to arrive before the bride-to-be! Even the late ones! If the shower is scheduled from 12 noon to four o’clock in the afternoon, invite your guests for 12:00, but don’t arrange for the bride to arrive until at least one o’clock. An hour should be enough time for all your guests to arrive and not compromise the element of surprise for your bride-to-be! The maid of honor along with the bridal party should also make sure that the venue is nicely decorated, that place settings are done, and that there is a good amount of games and entertainment for the guests. Consider the number of people attending and try to anticipate how long it may take the bride-to-be to open her gifts. Do you want her opening them all at once (towards the end of the shower) or do you want to break it up with a game or two in between gift-opening sessions? These decisions can be made by the bridal party and maid of honor once you have a better idea of how many guests you are expecting. When discussing what games to include in the shower festivities, try to make sure they are appropriate for all those in attendance. You don’t want to frighten poor grandma with any risqué jokes or humor! 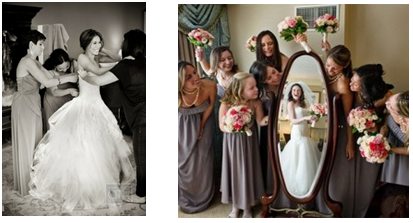 Reflect on any past showers you’ve attended and ask fellow bridesmaids or family members for input as well. The internet is also a great source of ideas for everything from invitations, favors, decorations, and games! 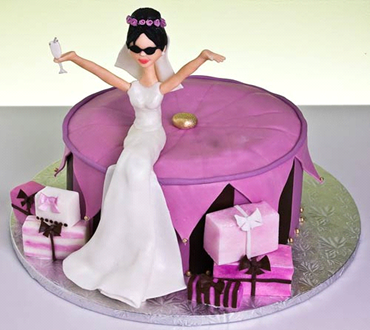 This is a very special time for the bride to take just one day out of her Wedding planning and relax with her loved ones in a very happy environment, stress-free! With spring just around the corner, wedding season is quickly approaching! A spring theme is perfect for this time of year with so many options for color schemes, reception décor, favor ideas, and floral arrangements! Pastel colors are absolutely perfect for this time of year from blue, purple, and pinks, to shades of white and yellow. These colors are perfect to recreate a happy outdoor garden setting, even if your wedding is indoors! When planning your wedding, consider what flowers are in season. During the spring, amaryllis, anemones, lilies, cherry blossoms, dahlias, forsythias, gardenias, orchids and tulips are just a few of the most popular seasonal blossoms for floral décor. Daises are also a great addition to bouquets or floral arrangements and can provide a great spring accent for table settings, place cards, centerpieces, and even on the wedding cake itself! To bring out the Easter spirit in a Spring Wedding, cute centerpieces can be made incorporating Easter elements such as brightly colored eggs, baskets, bright green grass-like décor, and bright wild flowers as well. 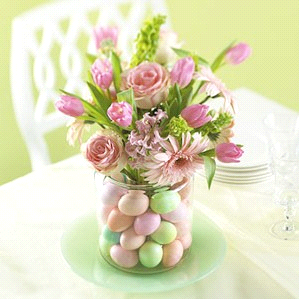 Brightly colored eggs would look beautiful and elegant if stacked in a tall, clear vase on the center of each table, and perhaps flower petals around the base of each one for an added spring feel. No matter what the bride and groom decide to do, any of these ideas can bring out the joy of the spring season with beautiful color schemes, endless floral décor possibilities, and springtime decorations in the atmosphere!